Meyer Lemons, Meyer Lemons and Meyer Lemons! 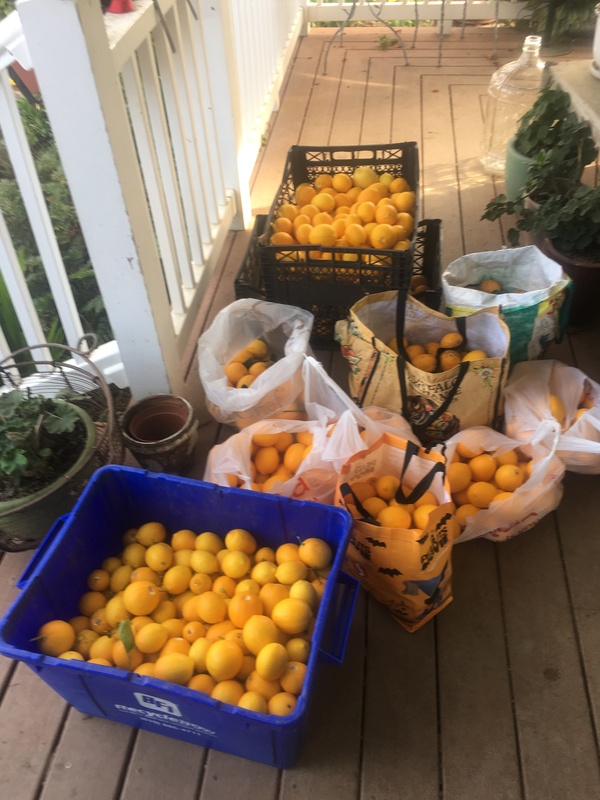 Thanks to all our friends that filled our porch with Meyer Lemons. For those of you that don’t know, Erickson Ranch makes jams and jellies from the fruit and vegetables we grow. 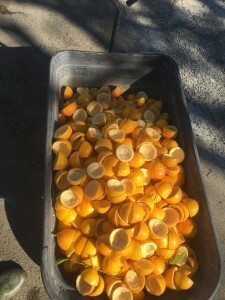 I found myself in an interesting predicament this winter during the Meyer Lemon season. Each year we make Meyer Lemon jelly during February when the lemons are ripe. Well, this year our lemon crop was very small and not as plentiful as in years past. We have one tree and it usually produces plenty (if not more than we need). We press each lemon extracting the juice, let it settle over night which allows the sediment to settle out leaving us with pure juice. We kept ours eyes open for each and every Meyer Lemon tree we saw in our travels. Should we knock on the door of the lemon tree owner, see if we could gleen the fruit from their tree and solve our plight? Perhaps not! Let’s give Facebook a try. I posted my need for Meyer Lemons and what an absolutely wonderful response we got. A jar of lemon jelly was a small thank you for our lovely friends that helped us solve our 2016 lack of Meyer Lemons. Apparently many people have a Meyer Lemon tree in their yard. What an outpouring of Lemon Love!! I can’t thank our followers on FB enough for coming to our rescue. As a small business, we have come to the realization the importance of Facebook. For businesses like ourselves it is often difficult to learn to promote, in a positive manner, to the public what you are and why customers should come our way. The generous outpouring and response of our customers has helped us! Meyer Lemon Jelly – the final product! One may be asking, “What is the big deal with the Meyer Lemon?” Lemons are tart and certain varieties are almost impossible to eat. The Meyer Lemon is a native of China and thought to be a cross between a true lemon and either a mandarin of common orange. It was introduced to the United States in 1908 by the agriculture explorer Frank Nicholas Meyer. The flavor of the Meyer skin is fragrant and thin with a slight orange tint when ripe. The flavor is sweeter, less acidic than the common Lisbon or Eureka supermarket varieties. 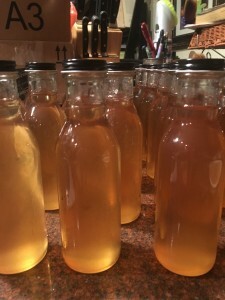 We never considered making Meyer Lemon jelly until a lovely friend came across “THE HOUSEHOLD SEARCHLIGHT RECIPE BOOK” written in Topeka, Kansas in 1936. She purchased it from a garage sale, copied parts of the dog-eared pages and gave it to me as a gift. How fun it was to look at the traditional and not so traditional recipes from times past. We drew inspiration from the Lemon recipe and realized it would be a nice seasonal addition to our jam selection. 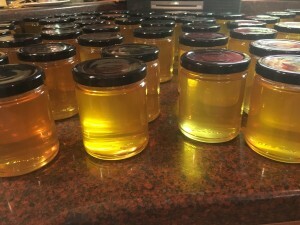 This particular jelly can be used as a marinade for chicken, on a warm scone and spread over a home made yellow cake with small holes made with toothpicks to allow the jelly to spread through the cake. Cream cheese lemon flavored frosting is the perfect topping!!  Come to Erickson Ranch during the summer season on the weekends for fresh fruit, vegetables and jam tasting. Please visit our website www.ericksonranch.com for information about us as well as events we will be attending. What a challenge, but how exciting! We have a long history with you through my late Uncle, Bob Wong. We are delighted you have a plan to survive, will check out your FaceBook page and hope to see you soon for apricot and a jar of the meyer lemon jelly.